Pour 1 Quart of Boiling hot water over 1 oz of raspberry leaf (about 1 c). Let the brew steep for about 8 hours, or overnight. Strain and consume. Store unfinished infusion in the fridge. The taste of Raspberry Leaf infusion alone is quite astringent, so you may find that you want to reduce the amount of herb in your infusion. The resulting brew will be less potent, of course, but if you drink more of it, you will still get the good stuff into you. 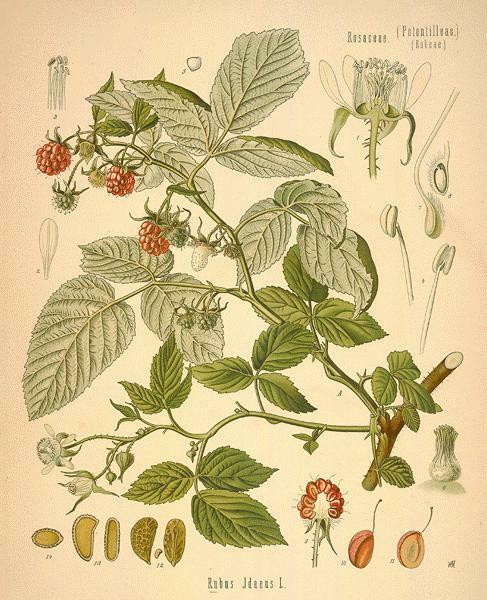 Another way to dilute the astringency of red raspberry leaf is to make it into a mixture. Lately, I’ve been into mixing red raspberry leaf, nettles, and mugwort together, 1/3 cups of each in a quart infusion. Nettles works kind of a like a general multivitamin tonic. I drink this frequently anytime, anywhere. 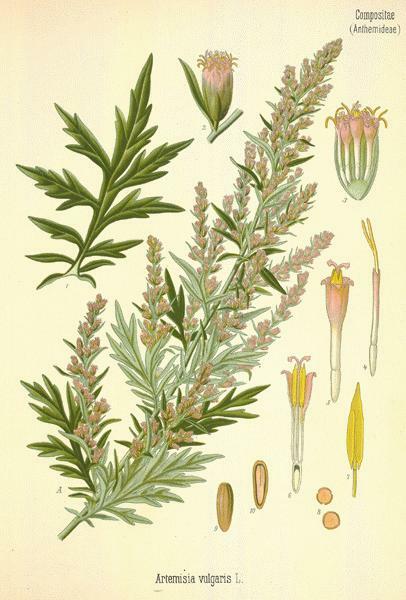 Mugwort is a bitter herb, also, so you may or may not like this added to your brew for taste. As Bennett, says, though, “mugwort moves energy in the uterus and can be especially helpful for women with clots. Be aware, however, that it may increase the menstrual flow as it does this. (p. 317).” So, use mugwort in your brew only if you find it helpful for your particular situation. Fill a quart-sized jar with 1/4c of brown sugar, 1/4 cup of water kefir grains, and filtered water. Mix well to dissolve the sugar. Cover with a cloth to prevent dust and flies from entering, and stir the mixture a couple times a day, for approximately two days, or until the brew is sour enough for your liking. The longer you ferment, the less sweet it will be. In another quart sized jar, put 1/3 cups each of dried nettle leaf, red raspberry leaf, and mugwort. Pour boiling water over the herbs and let them infuse overnight, or about 8 hours. Strain the herbs from the infusion, squeezing them well to extract all of their good stuff. 3. Mix your plain tibicos, your herbal infusion, and 1 quart of either coconut water or maple water. 4. Bottle the mixture into airtight bottles and leave at room temperature until they have built up some fizz. BE CAREFUL not to leave them too long, or you can create a bomb! See this post. “Burping” your bottles periodically can help to prevent too much gas pressure build-up. 5. Refrigerate your brew, and consume! 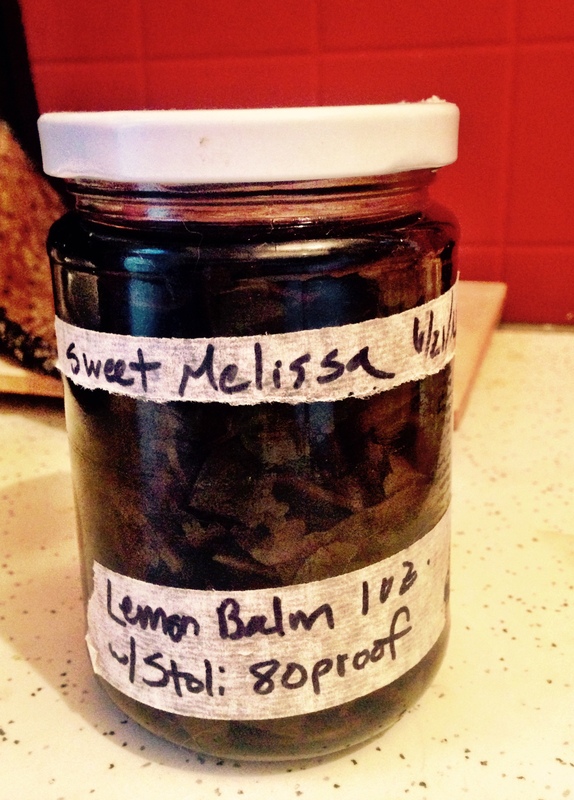 Sweet Melissa: A Simpler’s recipe. About a year ago, I wrote a post on Carmelite water, an herb-infused spirit that has many variations, but who’s defining herb is lemon balm. Lemon balm is also known as sweet melissa. 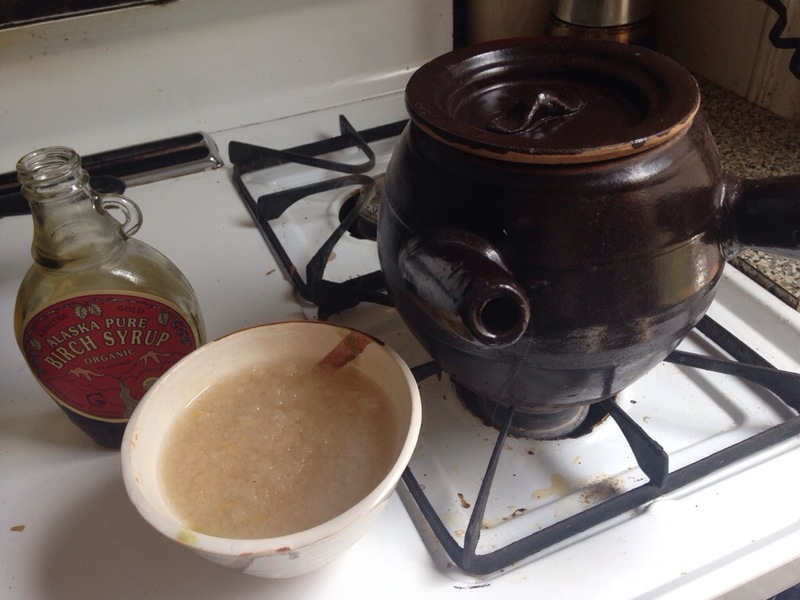 My first crack at Carmelite water resulted in a spicy brew where I tasted much more clove than lemon balm. The clove had a numbing effect on my tongue as I drank it– clove oil is known as a good herbal remedy for tooth aches, as it is both antiseptic and analgesic. Alas, I don’t have a personal photo of my own lemon balm. Here’s a public domain shot via wikimedia commons. 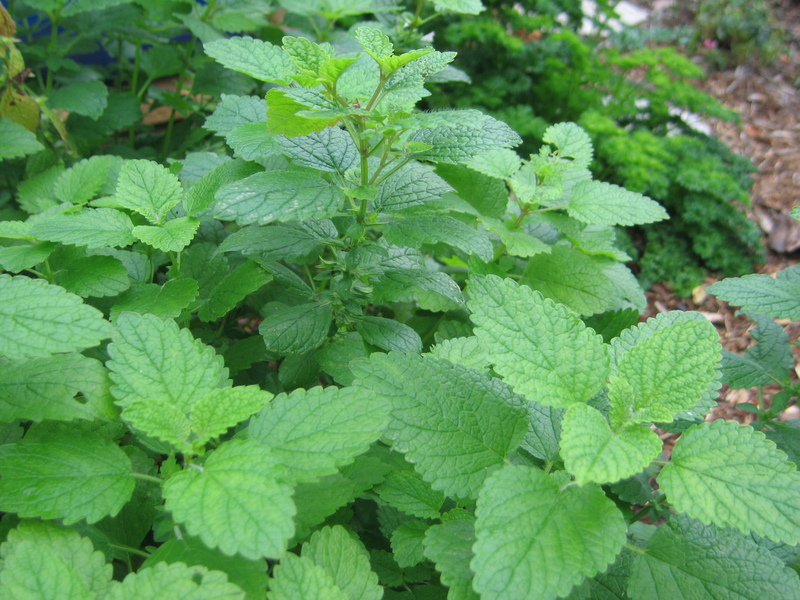 Lemon balm, or Melissa officialis, is a perennial herb. It’s calming, cooling, uplifting, and mildly astringent. Used in formulas for belly aches, anxiety, hyperthyroid, colds and viruses. (source: Dina Falconi’s Foraging and Feasting: a Field Guid and Wild Food Cookbook.) Lemon balm is also a great ally in the garden. Its lemony scent is supposed to repel various pests. Today, over six months later, I rediscovered the jar in the back of my fermentation cabinet. I decanted the vodka into a glass measuring cup, squeezed out the extra fluid from the leaves, and then tasted some. The taste is decidedly herbaceous, decidedly the taste of lemon balm, and of course strongly alcoholic. The alcohol has quite a bite to it. Last time I made carmelite water, I skipped the part where you add sugar to the mix. This time around, I heated up a tablespoon of water, added two tablespoons of honey to it, and mixed that into my brew. This softened the taste, but it is still sure to put some hair on your chest! Interestingly, I just found a recipe for lemon balm schnapps, apparently a Danish recipe. The author only infuses hers for 48 hours and uses significantly less lemon balm. I supposed my version is really more like a tincture in its herbal strength. The infused alcohol is a deep emerald green, although the lighting doesn’t quite tell you that here. I would call this experiment a success, although I’ve come to the conclusion that I like the way fresh lemon balm leaves smell way more than I like the way they taste. I would call picking a fresh leaf from my homegrown plant and smelling the aroma of it crushed between my fingers a kind of ‘peak experience.’ Eating that same leaf or drinking it in vodka hasn’t done it for me. 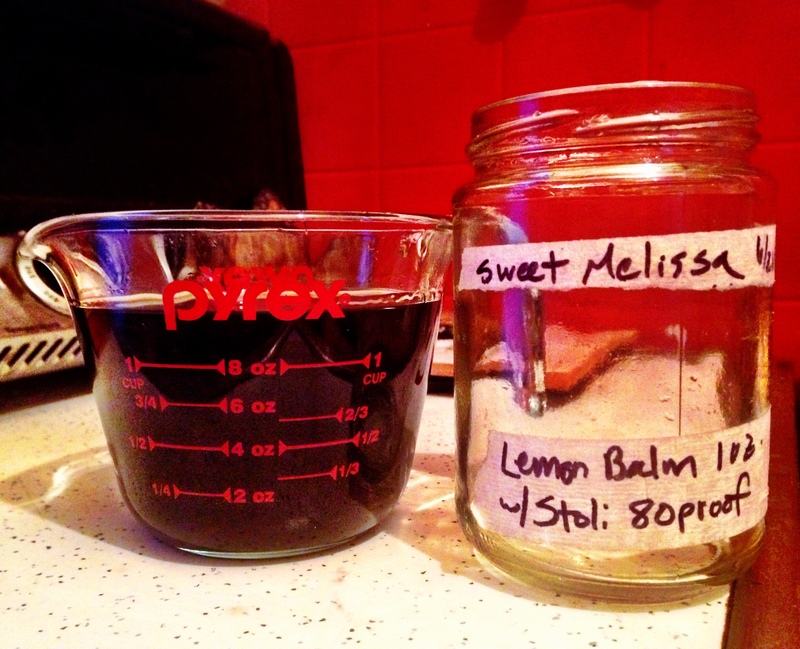 Perhaps using my original recipe and reducing the clove will create a more balanced blend that incorporates the taste of sweet melissa but makes it more delicious than this simpler’s recipe. I’d like to call out to my readers: do you have a favorite use for lemon balm? In the last year or so, I’ve noticed this stuff called Fire Cider on the shelves of crunchy stores in my neighborhood. It’s apple cider vinegar infused with a bunch of spicy things. It always looks appealing until I look at the price tag, and an 8 oz bottle is easily over 10 dollars. Then I look at the ingredients and say, “Self, you could make that really easily.” Months went by and I didn’t get around to it. But, now it’s a New Year! After a several-month hiatus from my blogging (not my fermenting, mind you), I am making a comeback with my own version of fire cider. 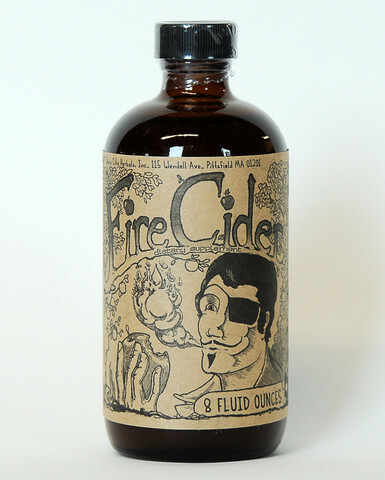 P.S., Since I first wrote this entry, I have noticed some prominent herbalists voicing concern over the company that distributes fire cider. Although Shire City Herbals have popularized it by reaching a wide distribution, they certainly did not invent it. However, they have trademarked the name: one which I believe the herbalist Rosemary Gladstar originally coined. One of my readers recently posted a comment to remind me of the lack of integrity that this company has displayed. You can read more about the problem in this article she offered me. So, may I suggest that you don’t support Shire City Herbals with your purse, but instead contribute to the age-old tradition of making your own! This is the stuff popping up on my health food store shelves lately. The choice to compile it was quite spontaneous: I’ve been growing a number of Jun mothers for folks who are interested in buying them. In the winter, my kitchen runs on the cold side. My Jun brew ferments, but the mothers grow slowly. I stuck my fermenting jars on top of a seedling mat to encourage growth, but it has only helped so much. My most recent SCOBYs have been growing for a month. I have some nice ones now, but alas, my jun has gone to vinegar. What to do with all that vinegar? Eureka! Fire Jun Vinegar! I made my first batch today. I originally looked up the ingredients that the fire cider people use, via their website, www.firecider.com, and then I found another recipe on one of my favorite herbal sites, mountainroseherbs.com. Mountain Rose herbs is primarily a vendor, but they also have a blog with recipes. Between the two references, I compiled my own plan, and I threw together some ingredients that I had on hand. Here’s what I came up with. If you check out their pages, you’ll notice that both of the other recipes incorporate horseradish. I may try this in the future, but that’s not an ingredient I keep around my kitchen, so it’s not in there for this round. Use your own creativity and see what’s in your pantry to make your own. Pour your month long-fermented Jun that has turned to vinegar and is way too sour to be palatable as a beverage by itself over the rest of the ingredients. Wait 4-6 weeks for the jun vinegar to be infused with the spices. You may want to shake the jar occasionally, and you may want to burp the jar in case your jun wasn’t fully fermented into vinegar yet and starts to build up pressure. Use a plastic lid if you have one, or put some parchment or wax paper between the jar and your metal lid, as jun likes to corrode metal. Strain out the spices through a cheesecloth into a new, clean vessel, squeezing the extra goodness out of the spices at the end. Mix honey into the brew to suit your taste. 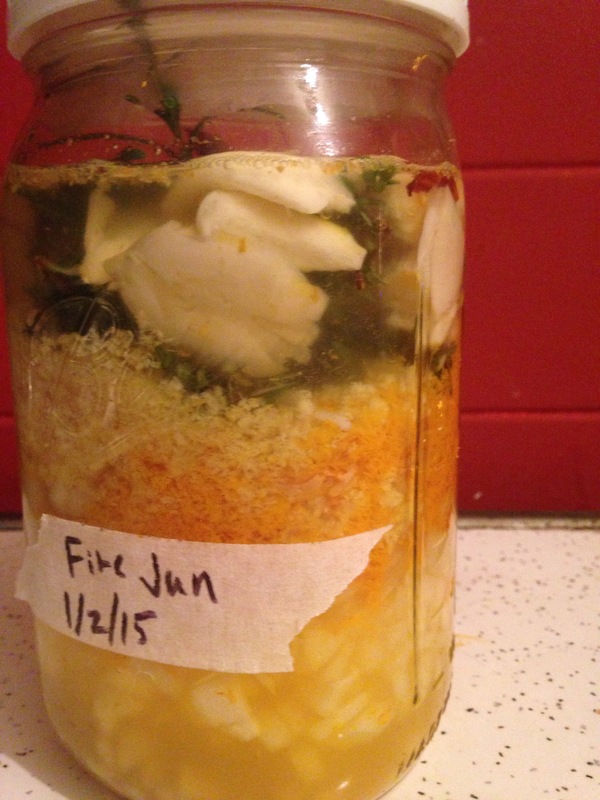 Your fiery jun vinegar can be consumed by the spoonful– all the spices in it are sure to make a great immune tonic. You can also use it as a vinegary addition to salad dressings, or to spice up a fresh juice or an herbal tea. If you try it out, let me know how you decide to use it! Last summer my travels took me to Boulder, Colorado, where I had hoped to gain some insight into the Jun culture. Unfortunately, Tonic “herban” lounge, did not have staff members that were very communicative or interested in the process. This summer, I had better luck meeting fermentation enthusiasts. 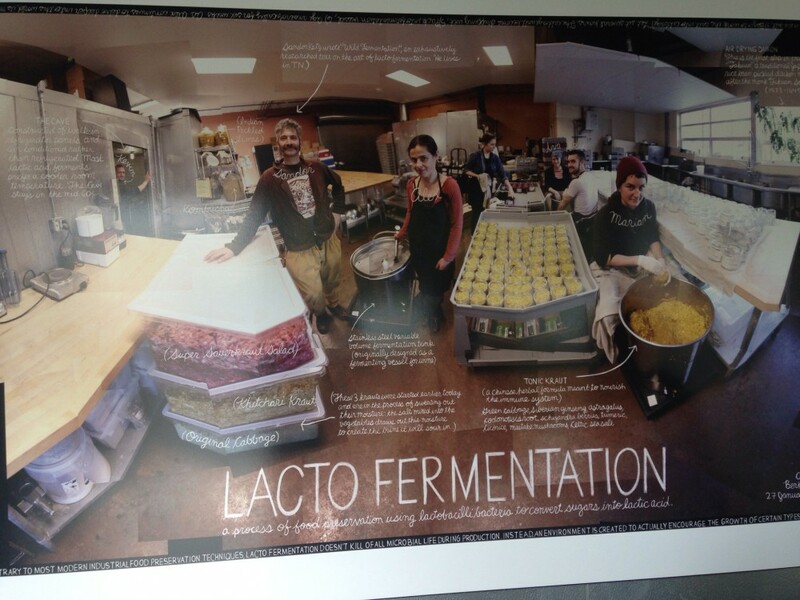 I was in Berkeley to take a movement workshop that was serendipitously located one block away from a fermentation kitchen called Cultured. 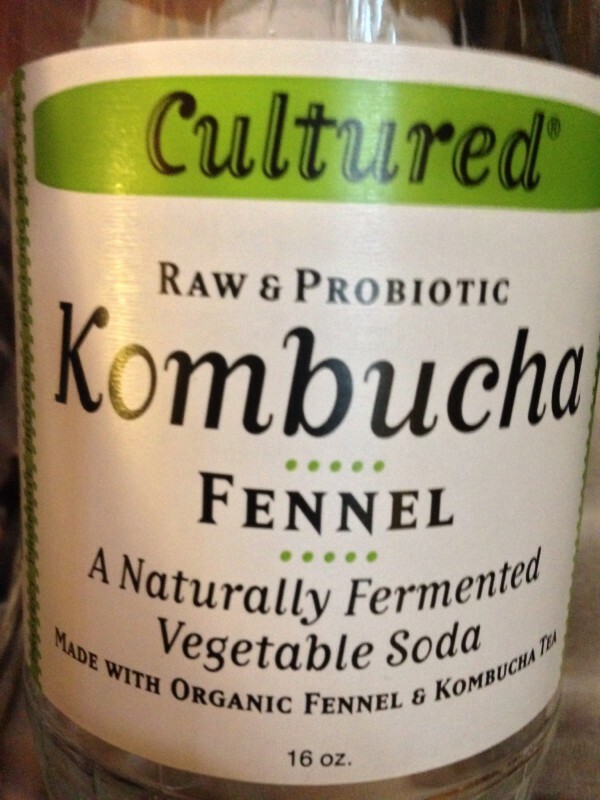 Cultured makes many flavors of kombucha along with pickles, sauerkraut and other things, depending largely on what produce is in season. A single glass-fronted refrigerator serves as a store front. My impression is that most of their product ends up on the shelves of other local establishments. I had the pleasure of catching Alex Hozven, who runs the joint, for a short conversation about her kombucha process. This is the wall sized poster that graces the entrance of Cultured. 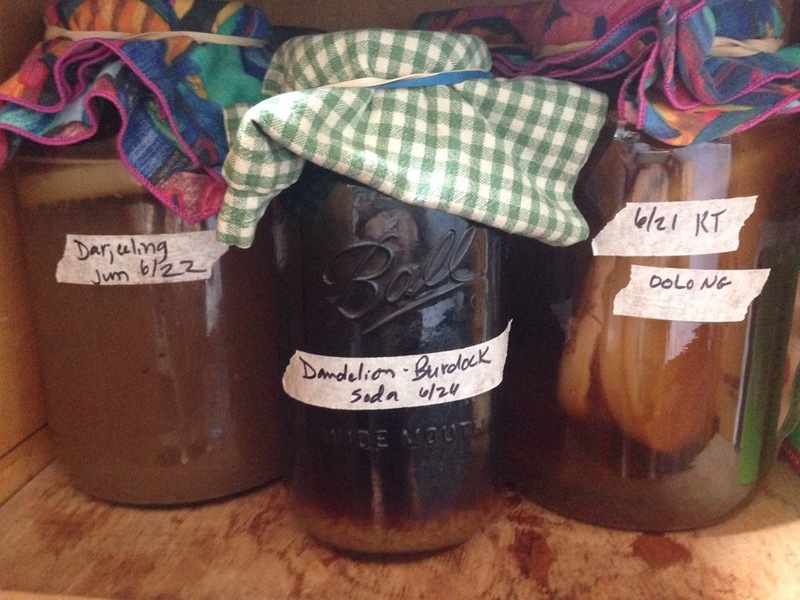 Alex makes some fancy flavors of kombucha. Over the two weeks I was around, I tried yellow watermelon-juniper flavor, strawberry thyme, cucumber lime, and fennel flavors. Just around the corner from the fridge, I could see the large fermentation vessels, and they didn’t just hold tea. I was intrigued to see one kombucha container that had fresh nettles in it. (nettles, my favorite!) Another one held floating juniper berries. Alex adds herbs into her primary ferments. I asked her about this, and she explained that kombucha can live in any number of herbal tea environments. For many of her ferments she uses a green tea base, and then adds flavor after the primary ferment (like I do), but with others she uses an herbal tea base and no tea– a great option for people who are avoiding caffeine. With the herbal tea ferments, she uses starter fluid from her latest green tea batch to get it going. 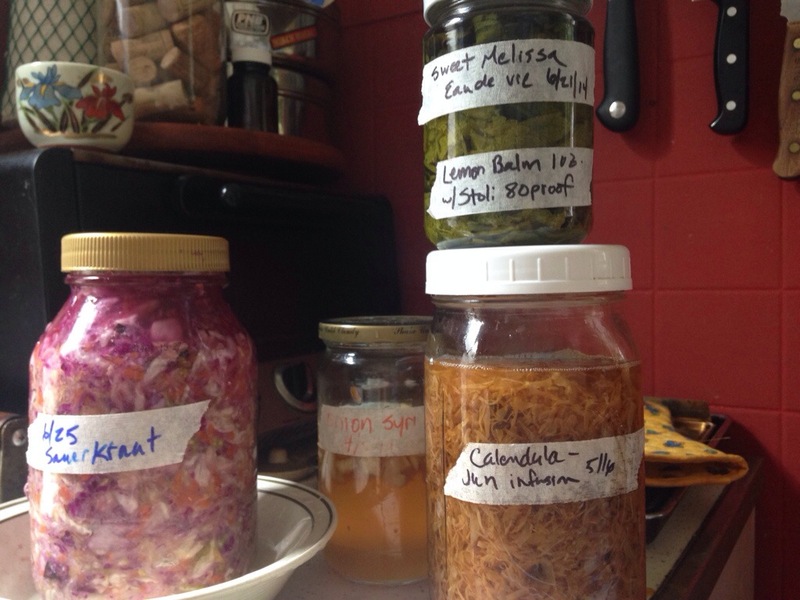 It makes sense that herbal ferments would be best to try with your spare scoby, and not to let them keep going over many generations, or you could degrade the culture. Probably some herbs work better than others, also: I once tried to make a rosemary beer with tibicos, and the anti-bacterial properties of the rosemary killed my grains! Although I frequently do herbal experiments with the primary ferment of tibicos, I’ve always been a purist with my kombucha and jun cultures. Maybe it’s time to branch out…. 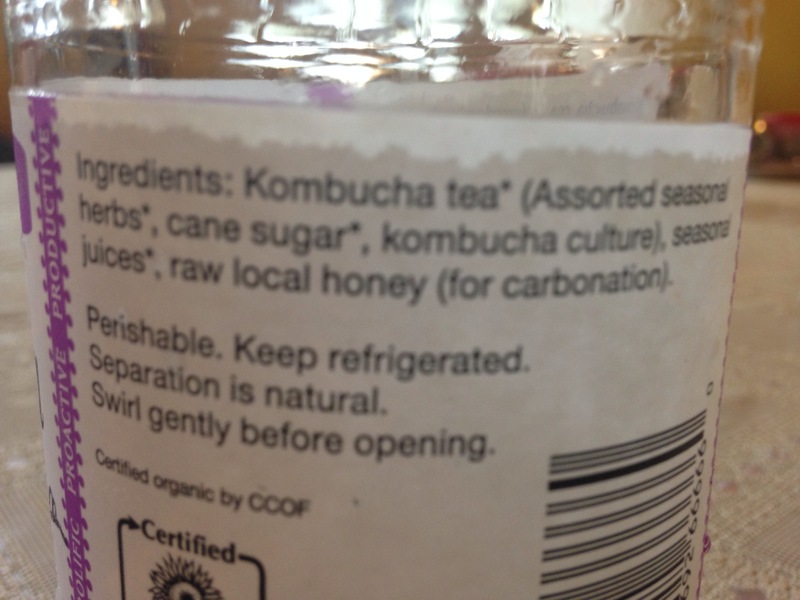 The other thing that I noticed about Cultured’s kombucha is that the ingredient list includes honey. Alex does not use honey in the primary ferment, but she does add some when she bottles it. The extra sugar in the secondary ferment makes her bottles generously fizzy. Tricky. The ingredient list: notice the addition of seasonal herbs to the primary kombucha tea ferment, and honey to the secondary ferment. As I browsed the refrigerator shelves at Cultured, I couldn’t resist picking out the weirdest pickle product possible. They had something called kasuzuke, which is vegetables fermented in sake lees. Sake is Japanese rice wine, and lees is the yeast sediment byproduct of wine making that brewers generally strain out to create a clearer product. I’ve strained the lees out of my blackberry wine and honey wine/mead creations and thrown it away. There were a few kasuzuke vegetable options, but of course I picked the most exotic sounding one. I chose Negi, which turns out to be not so exotic. It’s a variety of green onion. 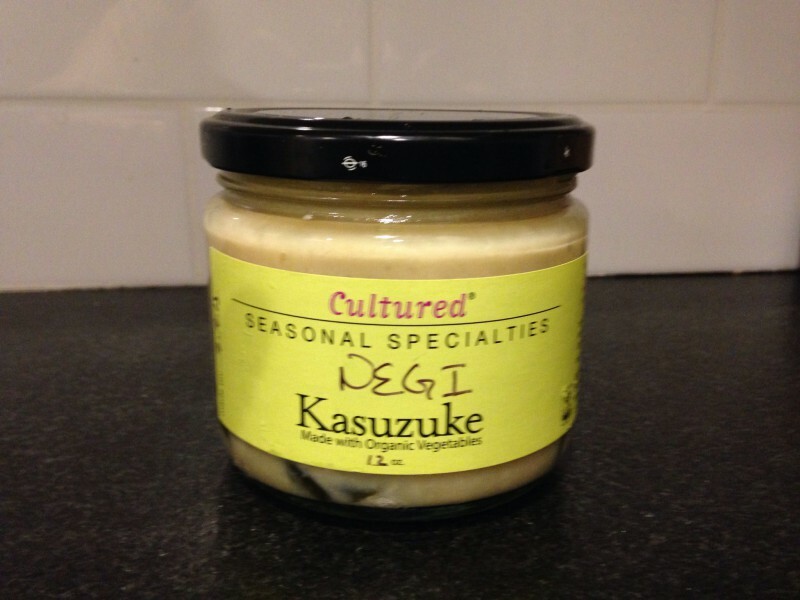 Cultured’s kasuzuke was 16 dollars for a 12 oz container: not something I would buy every day, but also it seems like a many-tiered creation process that I might never take the time to make. Here it is. I ate some one night on toast along with avocado, but I haven’t fully decided what to do with the stuff. Its appeal is less for newbies and more for seasoned fermentophiles. The gooey white lees takes up just as much room as the veggies in the container. It has a certain “ick” factor to it this way. The taste is oddly sweet and pungent. A few days ago, I posted a recipe for dandelion burdock soda. I’ve given burdock a write up before, but now it’s dandelion’s turn. 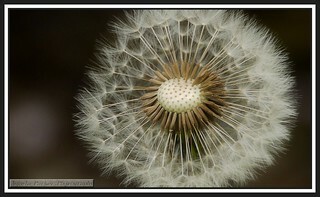 Dandelion, perhaps the weediest of all lawn weeds, is full of healing powers. The leaves are edible and make good, albeit bitter, salad greens. The roots have a nutty flavor to them. Dandelion root is available to buy commercially both in raw form and in roasted form. Roasting helps to fill out the flavor, but deprives the root of some of its bitter constituents which are the powerful healing elements of the root. David Hoffman sites dandelion as an ideally balanced diuretic. Usually drugs that stimulate kidney function can also cause a loss of potassium, but because dandelion is a rich source of potassium, it replaces what might be lost, and is therefore a nourishing way of addressing water retention, particularly helpful in people who have water retention due to heart problems. Robin Rose Bennett, in her new book The Gift of Healing Herbs (which I’ve been reading bits of daily lately) also sites dandelion as rich in iron, zinc, beta carotene, and calcium. She uses it as a tonic for the liver, as a part of reproductive tonics, and to support the lymphatic system. She also uses the flowers to make a tincture or an oil, which she uses in cases of emotional tension. 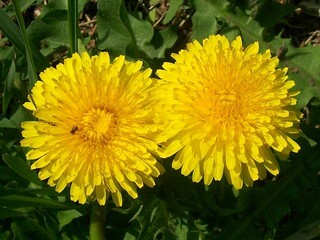 Susun Weed, in Healing Wise, also sites dandelion greens as valuable digestive bitters, and flowers as a pain reliever. Overall, I’ve gleaned that dandelion gets things moving through the body, which is great when we have places that are stuck, whether in our finer fluid systems, our digestion, our circulation, or our psyche. I know many people who, in an attempt to cleanse themselves of some perceived toxicity, turn to harsh methods such as fasting or colonics, 100 percent raw diets, or yogic salt water drink cleanses. Many of these fasters end up with worse digestion and depleted intestinal flora after their cleanse. Our bodies clean themselves if we support them. If we nourish the organs that cleanse us, we don’t need to resort to deprivation techniques. I come across the word “tonic” applied to dandelion and many other weeds. For a long time this word confused me. What is a tonic? Weed says it’s something that “nourishes the functioning (tonus) of a muscle, organ, or system; invigorates and strengthens all activity.” This definition is odd because it defines tonic with tone. What is tone? Hoffman says tonics are “herbs that strengthen and enliven either a specific organ, or system, or the whole body”. This explanation still left me confused, somehow, until I heard a definition of tone from my yoga and BMC teacher, Amy Matthews. She defines tone as “readiness to respond.” When I pair this definition with the understanding that “reaction” and “response” are two very different things, I get a better chance of grocking what tone is. With balanced tone, our organs are able to rest when appropriate, and become active when necessary. Ready to respond means being attuned to any situation. Tonic herbs are helpful because don’t just stimulate our organs: they nourish them so that the organs can do their work and regulate themselves. Thus, the wise woman tradition refers to herbs as our “allies,” rather than thinking of them like drug replacements. Add a couple scoops to your french press (just like you would coffee grounds), and pour boiling water over the herbs. Let steep 5 minutes. Pour a cup, adding milk to your taste. Dandelion-Burdock Soda: British and Beautiful. Recently my sister went on a trip to England, and she sent me this picture of this during her travels. I didn’t have the heart to tell her that I’ve actually seen this soda in New York (yeah, we have everything here). But, it’s not so common, and it is British in origin anyway. 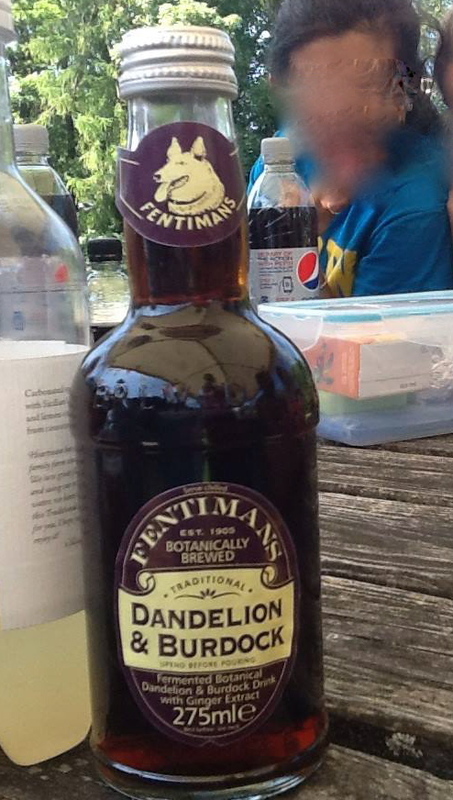 Nevertheless, her picture and enthusiasm inspired me to try making some of my own dandelion-burdock soda. I chose a roasted dandelion root, which gives the brew a nice roasted, nutty flavor. The burdock adds a pleasant sweetness to the drink. The combination of dandelion and burdock is great therapeutically, as well. As my friend Maya commented “double ammo for your liver!” Read my article on burdock here, and dandelion here. For my first batch, I went for simplicity and didn’t bother to add any ginger, although I might play with this same soda the next time I make a ginger bug. 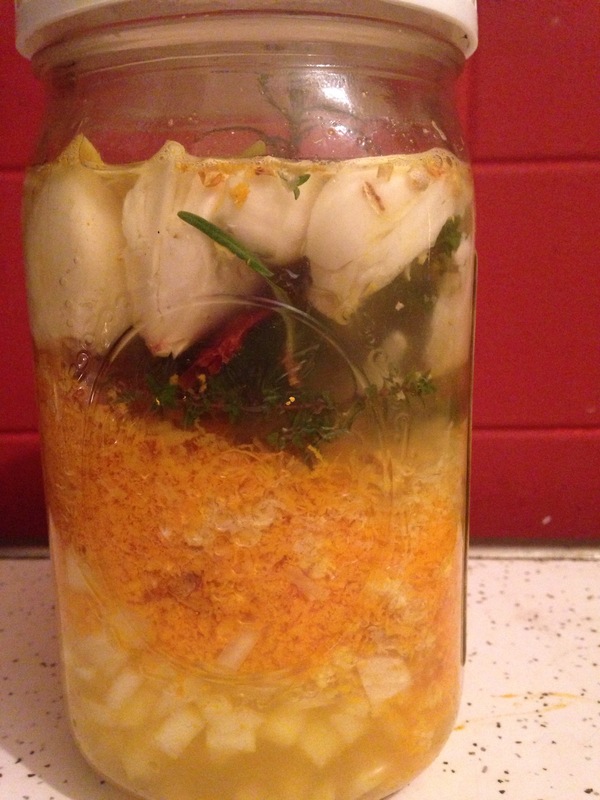 Here is how I made my Dandelion-Burdock soda, with tibicos aka water kefir. Over fourth of July weekend I brought a bottle up to New England for a taste-test from my newly returned sister. She liked my version better than the commercial brew, which she says was much sweeter and less herbal. 1 quart of filtered water. Bring the herbs and water to a boil and then reduce to a simmer for about 20 minutes. This is my handy herb pot from chinatown: the best $7 investment I’ve made in a long time! The clay pot keeps my brew hot for longer during steeping time. Any saucepan will do, though. Turn off the heat and allow them to steep for an additional half hour. Filter your herbs as you put the tea into a 2 quart container. The leftover “wort” (herbs) after steeping and straining. 1/2 cup of tibicos grains. Give the whole thing a hearty stir, and cover it with a breathable lid, like a cloth napkin or a paper towel, and secure the towel with rubber bands to keep flies out. Taste test your brew the next day to see if it is done. If it is too sweet for your taste, leave it another 12 hours and test again. Fermentation could take up to 48 hours, depending on your taste and the ambient temperature. Each time you check on it, give the tibicos a stir. When the brew is sour enough for your taste, bottle it, and put it in the refrigerator. The brew, wedged between my kombucha an djun ferments, on my fermentation shelf. Fermentation time for tibicos is much shorter, though! You may want to leave the bottled brew at room temperature for a few hours to build up some fizz, but beware of leaving it too long. Tibicos has exploded in my refrigerator, (see my cherry explosion article). If in doubt, it’s a good practice to “burp” your container after leaving it for this secondary fermentation. I recently have taken to using old wine bottles for my secondary fermentation, as opposed to Grolsch bottles. If the pressure in the wine bottle builds up too much, the cork will pop out and you will get a mess, but you avoid the danger of exploding broken glass! *These are the sweeteners that I happened to use: Sucanot also goes by the brand name rapadura, or evaporated cane syrup. It’s just unrefined sugar. You can find it at most health food stores. Birch syrup is particularly pricey and hard to come by, so this can be easily replaced with maple syrup or additional sucanot. I bought some online to try out making birch beer over a year ago, and I’ve had the leftovers sitting in the fridge ever since. Usually, I deem it too precious to use for any old occasion. I finally got over that and decided to use it up! There is the tibicos and the birch syrup, mid-process. High Season: what’s brewing in your cabinet? As we sweat through another midsummer, fermentations thrive! Here’s what I have in my cabinet today. A few are alcohol infusions, most are ferments. I have some writing to do about these, I guess! Stay tuned.